Lancashire League side Todmorden CC, who go to Lowerhouse on Saturday and host aT20 tournament on Bank Holiday Monday, are, from the left: Stu Priestley, Kristian Garland, Freddie Priestley, Martin Harlow, Simon Newbitt and Ben Sutcliffe. Front: Elliott Gilford, Andrew Sutcliffe, Tim van der Gugten, Ben Pearson, Hamsar Ali. The continued success of Walsden’s football section means the club’s cricketing resources will be stretched to the limit for Saturday’s first games of the weekend. Walsden, just behind champions Norden in the Central Lancashire League, travel to Rochdale on Saturday before hosting Leyland in the first round of the LCB Cup on Sunday. 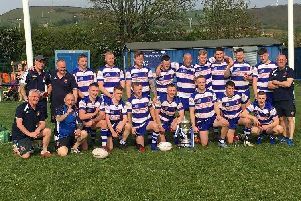 While the Scott Street men could be at full strength on Sunday, several players will be kicking a football on Saturday in the Rochdale Online Alliance’s President’s Cup final. Stevie Barker, Josh Gale and possibly Joe Gale could be missing from a first team which will also be without Jake Hooson (work) and Matt Dawson (work/back). The seconds will be even more depleted. Rochdale are third, two points behind Walsden but have played one game more, and their South African pro Wesley Landsdale and overseas amateur Marion Bent have been among the runs in the opening weeks of the season. Walsden reached the semi-finals of the LCB Cup last season before losing to Norden in a bowl-off and are keen to make another bold showing. “It is important for us because all the best teams in the Lancashire leagues are involved,” said spokesman Kenny Gale. Walsden had a bye in the nine-team Premier last Saturday but opened their Twenty/20 campaign with a group win at Heyside on Sunday. Umesh Karunaratne hit 50 and Stevie Barker 48 in the visitors’ 153 for four and Heyside were limited to 122 for eight with Sri Lankan spinner Karunaratne taking three wickets and Josh Gale two. Walsden have a fund raiser on Sunday (8.0 onwards) when the band Small Weller play at the club. Tickets are £5. Walsden (away to Rochdale, Sat): J Rawlinson, N Barker, J Shackleton, J Hanson, C Rushton, C Dewhirst, K Halstead, M Halstead, S Harkal, TBC, U Karunaratne. Meet 11.45am. Walsden (Tod T20, Mon): As Sunday but S Harkal for M Dawson.